One of the biggest mysteries of gardening I have never been able to solve is the dirt under my fingernails. Oh, I know how it gets there even when I am wearing gloves. The mystery is that even after I scrub my hands with soap and carefully clean the dirt from beneath my nails, I will settle down to read or do something not dirty and fifteen minutes later notice my nails have dirt under them like I never cleaned them. How does that happen? Are there little dirt reservoirs hiding under there? Does is seep from my skin? A mystery I tell you. After this weekend it will be days before my nails stop looking dirty. Yesterday I spent several hours in the cool, breezy sunshine removing a few layers of winter mulch from the flower beds in my front yard. Now I am a lazy gardener, or rather, a gardener who believes in allowing nature to do most of the work. The mulch was all leaves, maple and oak mostly from my tree and my neighbor’s that had fallen in October. Nature was kind enough to cover over the beds for me, why rake the leaves up and use some fancy store-bought mulch? I left most of the perennial flower stalks and grasses uncut and it all holds the leaves in the beds quite nicely with no work from me. Thanks Nature! My work comes in now, pulling off some of those leaves and cutting back the grasses and perennial stalks. I don’t remove all the leaves, a light layer remains to continue mulching duties and breaking down into nice compost to feed the soil. Even so, I cleared quite a lot of leaves from the beds. Since I am still feeling guilty about the bare ground beneath my apple trees after we did rake up all the leaves in the fall because of apple rust, instead of dumping the maple and oak leaves into my compost bin I dumped them under the apple trees. There is still a bit of bare ground but not as much as there was so I am feeling a little better. These are scattered throughout the bed, not in rows. 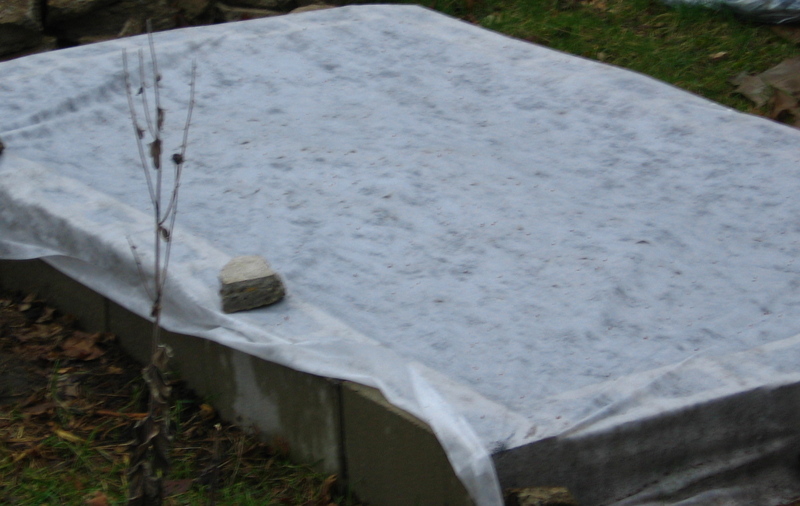 Next we watered and then put a length of fabric row cover on top to keep critters from digging. So far the row cover is working fabulously. The pesky squirrels, finding nothing to do in my garden, have been instead eating everything in my nextdoor neighbor’s. He’s been complaining about it. I was all sympathy on the outside and smug inside. I had better be careful though, I am not out of the woods yet when it comes to potential squirrel troubles. Also planted in the blocks of the polyculture bed is Bouquet Dill, Italian Flat Leaf Parsley, and Slo Bolt Cilantro. In other parts of the garden we planted Brown Mustard, Lincoln Peas, Russian Red Kale, and Giant Musselburgh Leeks. So exciting! weekend with seed starting mix and planted Purple Peacock Broccoli and Jacob’s Cattle Beans. We are starting these in pots because as the early vegetables in the polyculture bed finish, these plants will fill in the holes. There was supposed to be purple cabbage too but I somehow managed to lose the seed packet so we just planted extra broccoli. The trays are now out in the mini-greenhouse on our deck. I have no idea if we are starting enough of these or too many since I have not done a bed like this before. It will be an adventure! And now, a worm update. I gave up trying to convince the worms to move to the fresh food side of the bin. Not finding any simple solution, I put down a few newspapers on the kitchen floor and scooped out all of the old bedding and compost from the one side of the bin. This actually ended up working quite well. The wigglers don’t like light so as I removed compost from the top of the pile on the papers, they would keep burrowing down. There were still small worms and bits of uncomposted food to carefully sort out and drop back into the bin, but most of the worms ended up on the very bottom of the pile. When I got down to them I just scooped them all back into the bin. They are supposed to have some of the old bedding mixed in with the new so it worked out pretty well. And Bookman ended up helping me and didn’t complain. Much. Now I have a nice small bucket of lovely compost. I will be planting asparagus in a few weeks and the compost will go on their bed. It looks complicated but is really easy once you get the hang of it and it makes sturdy pots. The week ahead looks to be cool and rainy. Good for the garden if not for me being out enjoying it and adding to the dirt under my fingernails. I’m going to buy a newspaper just to make those pots!! I’ve used peat plugs that you add water to and which expand, but they are very expensive I find. I’ve also used those paper egg cartons, cut into sections, but of course you don’t eat eggs so that wouldn’t work for you. The newspaper pots are marvelous. I worked on scraping leaves off the patio and one bed this weekend. Lots of lovely worms. My neighbor also showed me his magnificent compost pile, which I’ve been invited to use and to add to. I’m going to give gardening another try this year, but only flowers. I need to get everything planted no later than next weekend. By August, the heat and humidity will have everything on the wane. Grad, aren’t the pots great? We found some peat pots on sale last year and got those and I was reminded how much I hate them. I find it difficult to keep them evenly moist without getting waterlogged or drying out so hardly anything we tried to start in them grew. I have much better luck with paper and small plastic pots. No, no egg cartons for us but we’ve used tofu containers before to sprout seeds 🙂 How wonderful of your neighbor to invite you to share his compost pile! I hope you have great success with your flowers! Timely about starting the seeds. I have some that need to be started separately from the beds. I’ve tried sticking my nails into a bar of soap before gardening, because even with gloves, still get dirt under my nails. Don’t know when I first read this tip, but wish I’d remember every time, not just after getting enough dirt under my nails to start a new garden. Yea, worms! Jenclair, we got very lucky that we planted when we did because the weather has turned rainy so we don;t have to worry about watering every day. 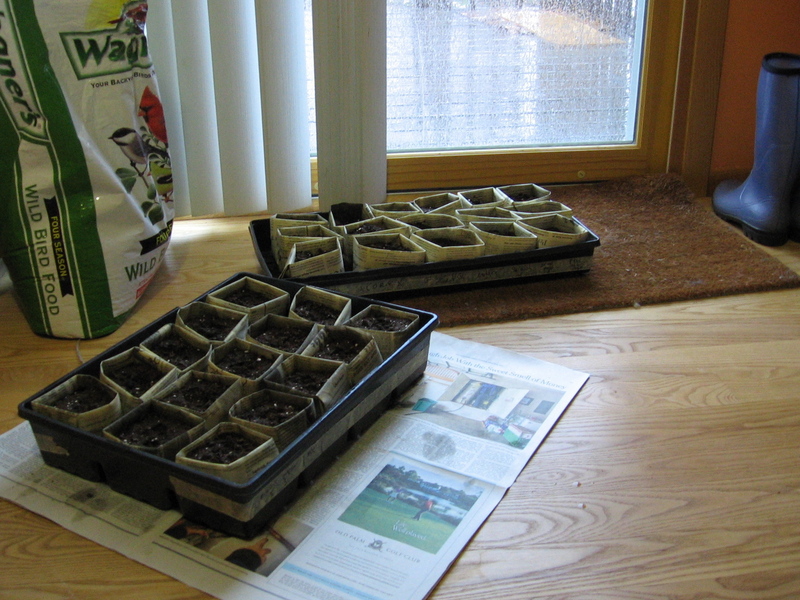 Of course it is also quite cool again (40s) so those seeds won;t really start sprouting until we get a warm, sunny day or two, but at least they will be ready for it! Same with what we are starting in the pots. I’ve never heard of the soap trick. I will have to try that one sometime. There was an article on the radio last week discussing the way in which ‘how to’ videos on You Tube have taken over in popularity from the music and personal ones. They interviewed a woman who has made a whole series about how to crochet. Now this is what I call a really good use of social media. Alex, I love all those how-to videos! I agree that it is an excellent use of social media, people sharing their knowledge like that. One of the reasons to love the internet. I hope to learn how to make baskets with the prairie grasses I grow in my garden and have found a couple of really excellent videos on YouTube that will show me how. I really admire all the time and effort you put into your gardening! My husband has been really doing all of the garden work and I see how hard he works. Of course I love to see the results of roses, succulents and other pretty blooms! Oh and we just started composting – woo-hoo! Iliana, thanks! I enjoy it so much it doesn’t ever really seem like work even when I end up worn out. You’ll have to be sure and share some photos of all your husband’s garden doings! Yay for composting! I not only have dirt under my nails but ingrained earth in my forefinger and thumb. I’ve been told that you should dig your nails into a bar of soap before a gardening session then the dirt can’t get under your nails and the soap scrubs out easily, but I always forget to do it. It’s so interesting to read about what you’re planting, I’ll be waiting another week or so before planting any veggies, we are supposed to get frost at the end of this week! pining, I will have to try the soap trick but I fear I will be like you and forget to do it and not remember until I am scrubbing my hands afterwards. We had a bit of sleet and wet snow yesterday so it is still rather cool, that’s why we’ve only planted cool weather things so far. It’s been raining all week so I’ve not been able to get out and see if anything has sprouted. Probably not yet but once this cold rain moves out and we get a bit of sun, fingers crossed! Our average last frost date is May 15th so the beans and tomatoes will have to wait until then.